Statement by Abdul Hamid Khan, the Chairman of the Balawaristan National Front (BNF), justifying the legality of Gilgit Balitistan as a sovereign state under UN guidelines. On behalf of the two million people of Gilgit Baltistan (Pakistan occupied Kashmir) I have the honor to draw your kind attention towards some gross root human rights violations, committed by Pakistan in this region. 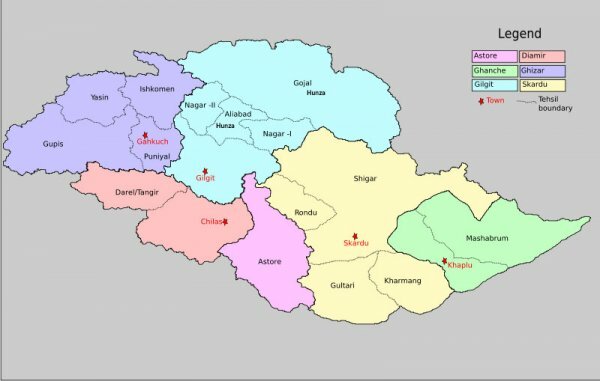 Gilgit Baltistan can be called a UN territory, owing to the historic fact that UN resolutions of 13th August 1948 and 5th Jan 1949 about this region are still pending. Pakistan’s current role in Gilgit Baltistan is a clear violation of UN, which had ordered Pakistan to withdraw its forces and civilians from the occupied area, under the obligation to UNCIP Truce Terms of 28th April 1949. The fate of the 2 million people in limbo due to enmity between India and Pakistan on territorial dispute. The people of Gilgit Baltistan are the most sufferer and their fundamental, legal, ethnic, cultural, economic and democratic rights are being denied. India has included this region in to its Constitution but it do nothing for the improvement of the misery of the people, while Pakistan has denied all fundamental, legal, ethnic, cultural, economic and democratic rights for the last 63 years. A) The territory evacuated by the Pakistan troops will be administered by the Local authority under the surveillance of the commission. B) Immediately upon the acceptance of these terms, the commission would enter in to consultation with the Government of India regarding the disposal of the Indian and state armed forces and with the local authorities regarding the disposal of the armed forces in the territory to be evacuated by Pakistani troops, with a view to initiating implementations of point 4 (A) and (B) of the commission's resolution of 5th January, 1949. "Immediately upon the acceptance of these terms, the Commission would enter into consultations with the Government of India regarding the disposal of the Indian and State armed forces, and with the local authorities regarding the disposal of the armed forces in the territory to be evacuated by Pakistan troops, with a view to initiating implementation of point 4 (a) and (b) of the Commission's resolution of 5 January 1949". (c) Other provisions were made for the release of prisoners of war and for the publicity to be given throughout the State of Jammu and Kashmir to the fact that peace, law and order would be safeguarded and that all human and political rights would be guaranteed. The truce terms also provided that they should be without prejudice to the territorial integrity and the sovereignty of the State of Jammu and Kashmir. Instead of withdrawing its troops within three months, as stipulated in Truce Terms of 28th April 1949 of UNCIP to pave the way for Local Authority under the Surveillance of UN Commission, Pakistan has multiplied its troops thousand times and civil, political and fundamental rights have been snatched by its Military, Intelligence Agencies and religious fundamentalists. Because of its biased and discriminatory policies Pakistan does not give any legal or constitutional protection to this disputed part of the world. Neither UN ever forces Pakistan to implement its Resolutions of 13th August 1948 or 28th April 1949, nor Pakistan shows any respect for the Universal Declaration of Human Rights in its occupied Gilgit Baltistan. Pakistan has continuously been hoodwinking International community by giving different names, designations and packages to its unlawful occupation. Whereas, in fact it never hands over the representative power and area to the indigenous people by complying with the world’s well trusted democratic procedures, as well as UN resolutions. The people of Gilgit Baltistan are not citizens of Pakistan as per the UN Resolutions of 13th August 1948 and 5th Jan 1949 and also as per the constitutions of Pakistan and India. People of this disputed region are kidnapped, tortured, killed, insulted and threatened by Pakistan’s ISI, Police and its subordinate Judiciary at will, in absence of the right to justice in any high court or Supreme Court, as the whole region remains an undeclared, de facto colony of Pakistan. Pakistani nationals and personnel of occupying forces are considered superior to the local indigenous people. The local police cannot interrogate any Pakistani national involved in the murder of a local person, because Pakistan’s Army and its ISI protect its own nationals, by making them immune to the colonial law. This is the occupied territory where people are not protected by any constitution and law, due to absolute lack of requisite action by the UN. According to the constitution of Pakistan and UNCIP resolutions Gilgit Baltistan does not fall under the legal jurisdiction of Pakistani courts. Pakistan imposes its nationals as head of Judicial system to this disputed region without any justification with the sole aim is to punish the local indigenous people of this new colony of 21st century, which is flagrant violation of UNCIP resolutions. The judicial system prevails in this part as par with a Session Court/District Court in Pakistan. The whole system including Administrative and Judicial are un-constitutional and illegal according to UN resolutions and Pakistani constitution and laws. The Courts, namely Chief Court and Appellant who award death sentence or life imprisonment to the local indigenous people of Gilgit Baltistan without giving them the right to appeal in High Court or Supreme Court of Pakistan or elsewhere, because there is no High Court and Supreme Court in this disputed and Pakistan occupied part of Jammu & Kashmir. The following people were given death sentences without giving them the right to access High Court and Supreme Court. 3-Shabeer Hussain resident of Astore, who is absconding. 6- JUMA KHAN son of (S/O) MEHMOOD Resident of (R/O) MINAWAR GILGIT; FIR NO 81/08 U/S 302 PPC 6/7ATA PS (POLICE STATION) CITY. 7- SAYED IZHAAR HUSSAIN S/O SYED ALTAF HUSSAIN R/O KHIMER JUTIAL GILGIT; FIR NO 93/05 302/34PPC 6/7 ATA PS CANTT. 8- EHSANULLAH S/O UZAR KHAN R/O BARGO GILGIT; FIR NO 408/05 U/S 302/324/34 PPC 6/7 ATA PS CITY. 9- RAHAT AMIN S/O MAYOON R/O BARGO GILGIT; FIR NO 408/05 U/S 302/324/34 PPC 6/7 ATA PS CITY. 10- NAVEED HUSSAIN S/O FIDA ALI R/O BARGO GILGIT ; FIR NO 163/06 302/34 PPC 6/7 ATA PS CITY. 11- ATIQUE HUSSAIN S/O LATIF HUSSAIN R/O SAJADIA MOHALLA GILGIT ; FIR NO 124/09 U/S 302/109 PPC 6/7 ATA PS CITY. 12- SHAMEER HUSSAIN S/O FAQEER MOHMAD R/O BURMAS GILGIT; FIR NO 124/09 U/S 302/109 PPC 6/7 ATA PS CITY. 13- ISTIAQ S/O ABDUL LATIF R/O GILGIT; FIR NO 34/09 U/S 302/34/324/14 4PPC 6/7 ATA 1997. 14- MUJEEB UR REHMAN S/O AZIZIULLAH ; FIR NO 34/09 U/S 302/34/324/14 4PPC 6/7 ATA 1997. 15- FAREED ALAM S/O WAZIR KHAN ; FIR NO ,78/09 U/S 302/34,114 PPC AND 6/7 ATA 1997. 16- SARDAR HUSSAIN S/O MUHAMMD AYOUB; FIR NO, 78/09 U/S 302/34,114 PPC AND 6/7 ATA 1997. 17- MUHAMMAD SAJJAD S/O DOULAT AMAN; FIR NO, 78/09 U/S 302/34,114 PPC AND 6/7 ATA 1997. 18- ITRAT HUSSAIN; FIR NO, 13/2005 U/S SECTIONS 302/324/PPC 6/7 ATA 1997. 19- WASEEM ABASS S/O MUHAMMAD ISMAIL R/O HOSPITAL ROAD GIGIT;FIR NO,13/2005 U/S SECTIONS 302/324/PPC 6/7 ATA 1997. 15- ASHFAQ HUSSAIN S/O MUHAMMAD ALI R/O SAMI MOHLA GILGIT;FIR NO,13/2005 U/S SECTIONS 302/324/PPC 6/7 ATA 1997. 20- NAZEER MUHAMMAD S/O SHUKOOR MUHAAMD R/O SAMI MOHLA GILGIT; FIR NO,13/2005 U/S SECTIONS 302/324/PPC 6/7 ATA 1997. 21- HASHIM HUSSAIN S/O MUHAMMAD ALI R/O MEHERBAN PURA GILGIT; FIR NO, 13 /2005 U/S SECTIONS 302/324/PPC 6/7 ATA 1997. 22- IQTIDAR HUSSAIN S/O MUHAAMD ALI R/O AMPHARY GILGIT; FIR NO, 13 /2005 U/S SECTIONS 302/324/PPC 6/7 ATA 1997. 23- GHULAM –UD-DIN S/O GHULAM MURTAZA R/O MEHERBAN PURA GILGIT; FIR NO, 13 /2005 U/S SECTIONS 302/324/PPC 6/7 ATA 1997. 24- AMJAD HUSSAIN S/O TOTA R/O MEHERBAN PURA GILGIT; FIR NO, 13 /2005 U/S SECTIONS 302/324/PPC 6/7 ATA 1997. 1- SAYED YASIR ABBAS S/O SAYED SAJJAD ALI R/O KHOMAR JUTIAL GILGIT ; FIR NO 93/05 302/34PPC 6/7 ATA PS CANTT. 2- SHER NAWAZ S/O HAROON R/O BARGO GILGIT; FIR NO 408/05 U/S 302/324/34 PPC 6/7 ATA PS CITY. 7-Miro resident of Danyore, Gilgit. I appeal your honour to send a fact-finding mission to Gilgit Baltistan to ascertain, why these people are being given death sentences by Pakistani regime, despite having no legal rights to rule over this region. These so-called judges are being appointed on contract basis by the Minister and Sectary of Kashmiri and Gilgit Baltistan Affairs and Prime Minister of Pakistan, who has not been chosen by the vote of the people of Gilgit Baltistan. Secondly, a Terrorist Court has been established in this peaceful part of Jammu & Kashmir where not even a single case of terrorism has been reported so far, while Pakistan has not been able to establish terrorists Courts on its own soil, where terrorism is a routine. All these extra-Judicial killings and atrocities are to press the indigenous people of Gilgit Baltistan, so that nobody dares to oppose the occupation of Pakistan. UN should implement its resolutions and put pressure on Pakistan to immediately withdraw its troops and civilians from Gilgit Baltistan in compliance with these resolutions.